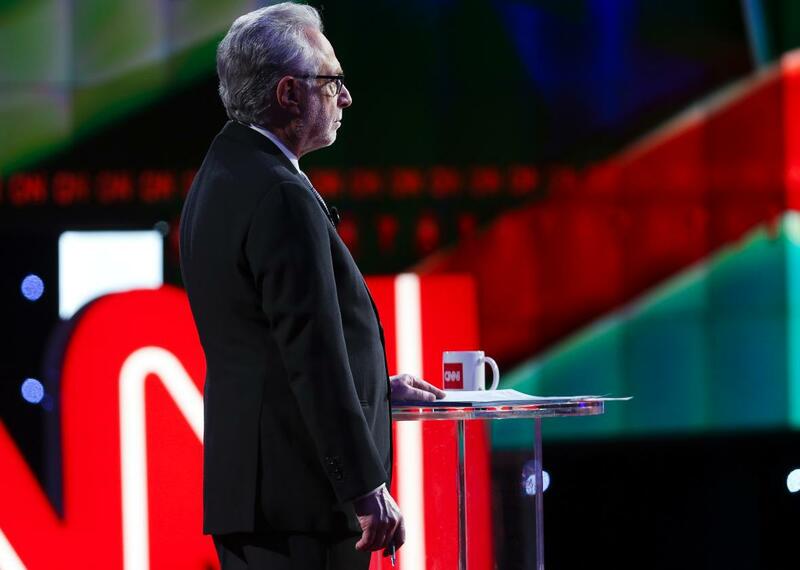 Wolf Blitzer and CNN do not exceed expectations at the GOP debate. Wolf Blitzer at CNN’s GOP debate at the University of Houston on Feb. 25, 2016 in Houston, Texas. Donald Trump’s constant refrain about American decline, which has been heard throughout this campaign season, had an ironic undertone when uttered at Thursday night’s debate on CNN. Other than Trump’s rise, there is no clearer sign of American decline than this erstwhile news network, which now combines superficial political coverage and tabloid-friendly content with none of the skill displayed by (the admittedly much more heinous) Fox News. Thursday’s debate was no exception: Wolf Blitzer’s questions were soft, and his follow-ups indirect. By the end, he seemed to have completely ceded control of the debate. It was a failure of hosting, but also a fitting metaphor for a news network that has completely lost its way. Things descended further when Hugh Hewitt, the conservative talk-show host, who for God-knows-what reason was chosen to co-moderate CNN’s debates, decided to focus on religious liberty. Instead of asking about, say, the fact that the three leading candidates on stage had all made gross comments about Islam—with Trump of course calling to ban Muslims from entering the country—Hewitt decided to focus on cupcake-baking Christians whose liberty is apparently being threatened by gay-marriage supporters. It’s bad enough that the entire Republican Party seems to view racism in America as something that happens to white people, and American religious bigotry as something that targets Christians; it’s even worse when CNN’s questions appear to tacitly support the latter assumption. When the debate turned to health care, Dana Bash did momentarily follow up on Donald Trump’s blather about coverage across state lines, asking the candidate to add details about his health plan. She could have lingered over the moment, but instead turned to John Kasich and Ben Carson, who gave empty answers. The end of the health care section ended with Ted Cruz bullying Blitzer into giving him a bunch of extra time; this pattern would recur. The conservative tone of the questions continued with Blitzer’s about Israel, which faulted Trump for his rather reasonable claim that he would remain neutral in the Israeli-Palestinian conflict. (Trump’s other statements about the Middle East suggest that he would—like the other Republicans onstage and Hillary Clinton—favor Israel.) Blitzer continued with Israel and the Palestinians by asking Cruz and Kasich to comment on Trump’s answer; it was part of a weird pattern wherein the moderators wanted the candidates to respond to Trump, but then kept interrupting them when they actually engaged him. In all, it was a disappointing debate that showcased everything that has gone wrong at CNN. Presumably sick of being accused of having a liberal bias, CNN has given plentiful airtime to Trump without really challenging him. (Anyone who doubts this should check out his interviews with the hapless Don Lemon.) Even if ratings are the main reason that this is the case, it doesn’t explain the conservative premises of many of the questions, or their lack of depth. Immediately after the forum ended, moreover, CNN’s Chris Cuomo conducted an absurd onstage interview with Trump, asking him softball questions, and even suggesting that the candidate had focused on policy during the debate! Trump may enjoy ranting about the media, but there is no question that CNN, like the other cable news networks, has done nothing but abet his rise.